Easy-on, easy-off liquid formula cleans and polishes in one step to restore color and shine. Perfect for lightly oxidized, scratched or stained gelcoat finishes. An economical, time-saving solution perfect for lightly oxidized or stained surfaces. Excellent for midseason finish maintenance. 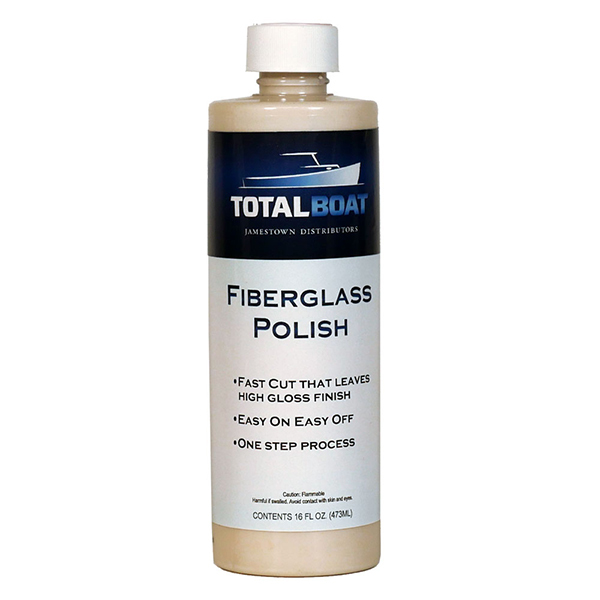 TotalBoat Fiberglass Polish combines a mild polishing agent with a protective wax coating to revitalize gelcoat finishes in a single step. It’s a perfect match for ridding your boat’s gelcoat of stains, slight scratches, and light fading. Multi-step polishing systems using rubbing compounds may be necessary on seriously neglected surfaces, but they are harder and much more time consuming to use by comparison. In addition, they are overkill for the jobs our fiberglass polish is suited for. Our polish is easy to apply and remove when applied by hand. No electric buffers necessary. Follow up with an application of TotalBoat Premium Boat Wax or Podium Finish Polish for lasting protection. Need soap, polish, wax, and a polishing towel? Save more money with our comprehensive 3-step TotalBoat Hand Polishing Kit.